In addition to graduations and strange U.S. national holidays: National Bubba Day (June 2nd), National Moonshine Day (June 5th), and National Paul Bunyon Day (June 28th), the month of June hosts Father’s Day(always the third Sunday in June). So, I decided to get Dallas Cowboy Fan and Scout some sweet snacks, but it has to be manly candy. The stuff they can stick in a golf bag/ backpack/toolbelt/ fishing vest/ coveralls/ spacesuit and eat when it darn well pleases them. I scanned candy sales and man-blogs. Here’s what men are chomping after their beer and BBQ. Thank Milton Hershey for wanting everyone (not just the rich) to enjoy chocolate. In 1894 he set up his factory in Pennsylvania and charged a nickel for a bar. It helped that he had a contract with the U.S. Army, sending 30 pound blocks to the troops overseas. Soldiers continued buying the nickel bars after they returned home. (SideNote: Hershey’s also makes Kisses, allegedly so-named because that’s the sound the machine made when smooching out chocolate blobs during manufacturing). Introduced in 1930, it was named after a favorite horse in the Mars family. High in protein with dairy and at least 16 peanuts, it’s gained notoriety lately by being a deep-fried treat in Scottish fish and chip shops and U.S. state fairs. Celebrity chef, Antony Thompson, created a Snicker’s pie, containing 5 of the candy bars and each slice providing over 1,250 calories. Most folks know the story. The candy was copied from British-made Smarties (chocolate pellets surrounded by “hard panning” to prevent the chocolate from melting in soldiers’ pockets during the Spanish Civil War. The son of Mars Co. (Frank Mars) and the son of the prsident of Hershey Choc. Co., William Murrie, combined forces hence the M and M. The agreement used Hershey chocolate which was advantageous because Hershey had control of the rationed chocolate during 1930. Brand Marketing is quite aggressive with the “spokescandies” turning up everywhere, so it’s fun to note one very important missed opportunity. In 1982 the company rejected the opportunity to be in a new Steven Spielberg movie, E.T., so Hershey’s took a chance with their Reese’s pieces. It’s estimated that Reeses’sales increased 300% due to blockbuster exposure. … and obviously June holidays have changed, but whether you’re celebrating, National Onion Ring Day, (June 22nd) or National Sunglasses day (June 27th) get the guy nearest you a candy bar and tell them one of these stories. What do you mean we can’t bury Grandma in red? I’ve been absent in the name of research, spending time with morticians and gravediggers. Thank heavens no one died. It was for a novel …not a horror novel. It’s a coming of age story, but one of the things that became wildly apparent to me was the CHANGE in the way we treat death over the last 50 years. GROWING UP in the ‘50s. My grandparents (and every old person I knew), had one good dress or suit in their closet which they might wear on special occasions, but they’d be sure to let their nearest relative know, “This is the dress you need to bury me in.” It didn’t matter that the clothing was twenty years old or two sizes two small. The mortician could fix that. Even before people were dead, they were planning what to wear. 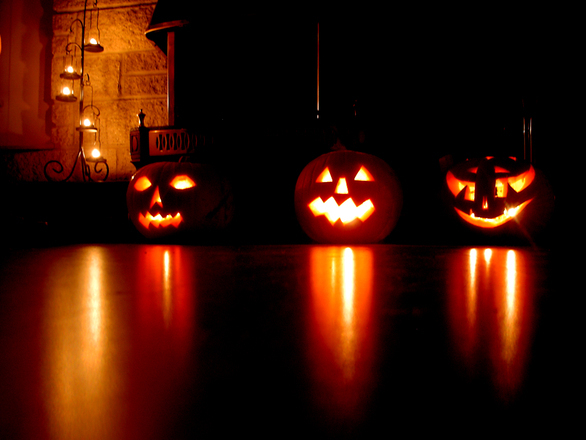 We couldn’t figure out why a dead man would care about our ear-splitting screams. And why did the adults get to laugh and tell stories that carried down the block? We don’t call them funeral parlors anymore, but that’s what they did…provide a safe pest-free place to sit with the deceased. When funeral homes bundled their services into packages, many of our family activities went away—moved to a more professional, air-conditioned, padded-chair visitation room where there was nothing for us kids to do but kick each other and dare the youngest cousin to go touch dead Aunt Mildred’s hand. And then the popularity of cremation brought an end to even more childhood exploits. CHANGES FOR THE TWENTY-FIRST CENTURY…New traditions are beginning. Who isn’t curious what people will say about you when you’re gone? These ceremonies are mostly being embraced by folks with a “fatal” illness. A small group of friends or family family gather to tell the dying person the heartfelt things he/she wouldn’t have gotten to hear at their funeral. The benefit is that it breaks isolation. Lots of folks don’t feel comfortable visiting a dying person. They don’t know what to say and feel uncomfortable about visiting.This ritual has become about gratitude and closure for the living and the dying. Newspapers such as the NY Times have “advance” or “draft” obituaries of famous pre-dead persons, so they’re ready to be published the moment the notice comes across the newsline. They’ll even phone the pre-dead for an interview. Now you can write your own obit and have it on file so you can “make sure the paper got it right.” (No guarantee anybody in your family will use it, though). Here’s a dandy DIY project. Folks are making videos and delivering their own obits to be watched at their funeral. Or…maybe you’d like to leave someone a message that you would’ve never uttered in life? A company will allow you to create any message you choose and they’ll send it for you after you’re dead. There are other changes in the “send-off to the great beyond.” But for now…tell me your stories. What’s a ritual you REALLY dislike at Funerals? The food? Noisy kids? Speeches? Let’s talk. And Where is Your Final Resting Place? Campuses are constructing columbaria—Walls which will hold cremains. The first one was built on the University of Virginia over 24 years ago. When alumnus Leigh Middleditch, Jr. couldn’t get into the university’s cemetery because it had run out of room, some of his friends helped finance a memorial wall with 180 niches. Sorry, there’s no more room in the wall now. All of the niches have been sold (in case you were getting your hopes up) $1800 each. Maybe you can get in on phase 2. For universities, these final resting places can build strong bonds of committment. The main hope is that people will also remember their favorite school in their wills and estate planning. The columbarium at Richmond circles a garden near the chapel. Students can be seen there, taking a thoughtful moment away from the noise and hurry of the campus. Like a stadium, sometimes the vaults get cheaper the higher up you go. Room at the bottom can go for around $5,000, the top $2500. Packing List and What I Wish I’d Done Differently for the Coast to Coast, U.K.
At Elaine’s Kitchen. A sheep farm in the middle of fields and fields. For my regular blog readers who’ve read this far about this trip, thank you. I hope you had a good time and a good laugh. I understand that you may not care about an equipment list. But…it may help you if you’re planning some other hike. Either way, thanks for joining me on this journey. If you’re saying to yourself, “I’d like to do that.” Then I’m telling you, it’s an amazing life experience. and worth all the work. Hopefully, this will help you plan. This is my revised list after I returned from the C2C. It is geared for hiking the trail in late July to early August. And no….I don’t work at REI or Amazon, but in case you don’t know the gear I’m talking about or where to get it, I put some suggested places to look it up). 1 long-sleeve upf, ventilated hike shirt. 1 boots (broken in and water proof.) NOTE: I wore my faithful ankle-high leather Montrails. This is my second pair I’ve owned. I LOVE these boots and never regretted the weight. I preferred the support and sure footing on the long and grinding paths. I also outfit them with Super feet orthotics for even more support. 1 pair after-hike thin socks. 1 pair gaiters: I carried them, but never used them. Probably if I were doing the C2C in May—I’d have have needed them more (or maybe on that very last bog hole). ALLERGY medicine…DON’T IGNORE this item…you’ll be sorry. The pollen is FIERCE! Vaseline/Socks: NOTE: The best blister prevention is a good fitting pair of boots. But every long distance hike trip I’ve ever done, I’ve found coating my feet in Vaseline and covering with socks while I slept, kept skin soft, pliable, and resistant to other problems. I didn’t get any blisters on the C2C. Gold Bond powder– for heat rash which you get in the most interesting places. 1 small back pack (NOTE: Don’t crap out and use a piece of junk. I was very glad I carried my Ospery 35 liter daypack that has a lightweight frame. It saved my shoulders from a lot of pain. I suggest you wear your daypack around home for several days and see if it pulls on your shoulders. 3’x3’ square of Tyvek (If you can get your hands on a small piece of this waterproof moisture barrier that is used to wrap houses before putting the siding on…it’s GREAT. It packs flat and small, and you can whip it out to sit on no matter how wet or how much sheep doo is around). 1 pair trekking poles (NOTE: I always use poles when I hike. They take a lot of stress off my knees and hip flexors. On the C2C, they were invaluable in crossing bogs and streams, beating back thistles, helping me push uphill, and they kept me from a couple of nasty tumbles on slippery slopes.) Just don’t lay them down and forget them like I was always doing. God bless the folks who ran after me, waving my trekking poles!! NOTE: We brought a charger to field charge phones, but never used it. We never left the GPS app running. Only turned it on when needed. Then turned it off. Extra debit card: I created a new account for a preloaded debit card. That way if I lost it, the risk was minimal and nothing (autopay) was tied to the account that I’d have to change. Credit card with chips and 4-digit pin. Gaia GPS Navigation App: This $20 app for iphone was very handy (2015). The GPS waypoints are available to download from the Trailblazer.com website. Of course, you won’t leave the app running all the time, but when the need arises, you can turn on the app. Let the satellites find you, and establish your position to the path. HINT: Practice with your GPS at home. Take a class. Several people we met had navigation devices, but weren’t sure how to use them—so they weren’t very helpful to them. Compass—I bet I pulled my compass out of my pocket at least 10-15 times a day to check direction and trails. Maps—we used Stedman’s maps. We also had Harvey strip maps, but only looked at them once. If you think you’re the type to go OFF TRAIL. I’d definitely recommend Ordinance Survey Maps. As small as you can get it. Remember, you’ll be carrying this loaded suitcase UP and DOWN several flights of steep narrow, narrow staircases EACH MORNING and EACH NIGHT (after you’ve hiked all day). The luggage carriers put maximum weights on luggage, but you DON”T want to be hefting the maximum weights. Be nice to your back—it has to support you 192 miles. And it IS plenty of time to walk. WALK. EVERYDAY. DAY AFTER DAY. But part of the experience is exploring. If we were to do it again, we’d schedule 2-3 rest days, so we could take more sidetrips and explore the wonderful areas. It would also help us return to the trail more invigorated. 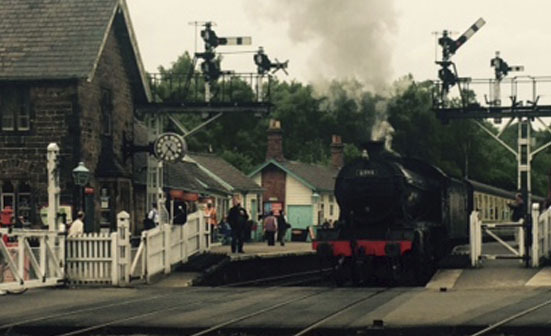 We’d probably take off to explore, Grasmere, Richmond, and possibly Grosmont (so we could ride the steam trains to Whitby and Pickering). 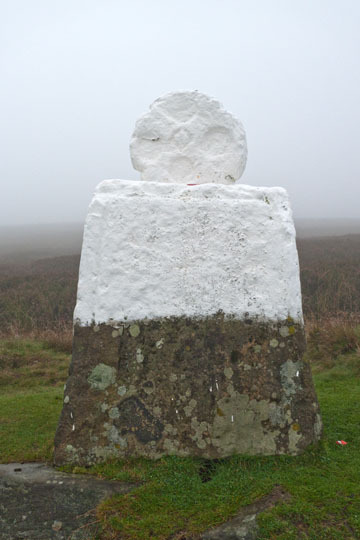 We’d also break up that 21 mile haul between Osmotherly and Blakey by stopping at Claybank. to walk across an entire country and drink it in…eighteen days is just the beginning. May you have blue skies, smooth trails, and good companions wherever your next journey leads. Surprise! Surprise! This is the first day that my back doesn’t hurt. The sun is shining , pigeons are cooing, and…wait a minute…. More Moors. Walking to the horizon. I just realize that we heard doves at dawning. Was it that way yesterday? That seems strange because through most of this hike, we’ve been awakened by sheep baaaing beside the windows. At what point in the geography did our alarm clocks change?. The ubiquitous sheep have disappeared. Even the grouse song is gone—replaced by common birds and a few gulls. 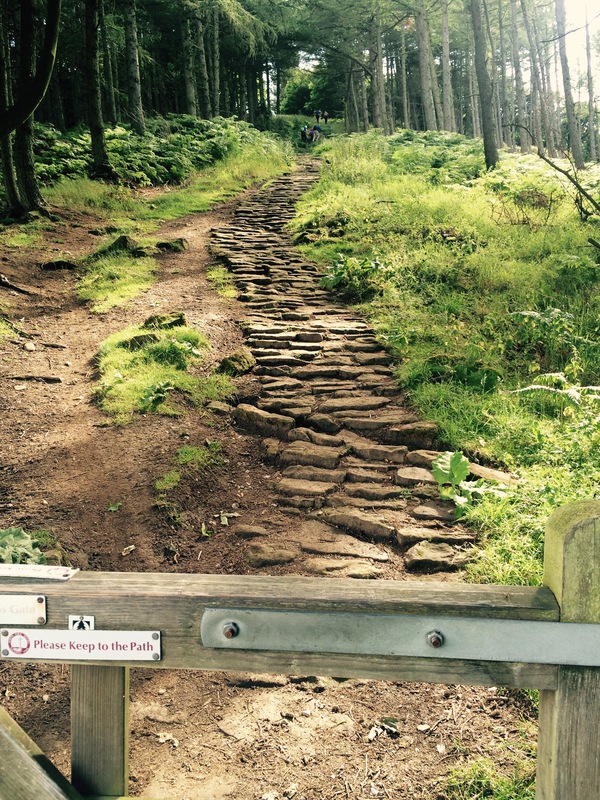 The first step outside of Grosmont treks uphill and continues upward at a heart-knocking slant. We make good time to Little Beck, another stream, dancing through a forest. It seems Wainright has a penchant for wooded glens so muddy it requires big stones to tread through it. As we slip and slide from stone to stone, I notice when we’d started hiking two weeks ago, the Elderflowers in the woods had been creamy-white and fragrant . Now most of the blooms have dried up and are brown. Even the blackberries which hadn’t opened their flowers when we started at the Irish Sea, now have knobby green fruits on the vines. It makes me a bit melancholy to see evidence that time has kept rolling along, but while we were wrapped in this adventure…it had seemed to us that it had stopped. 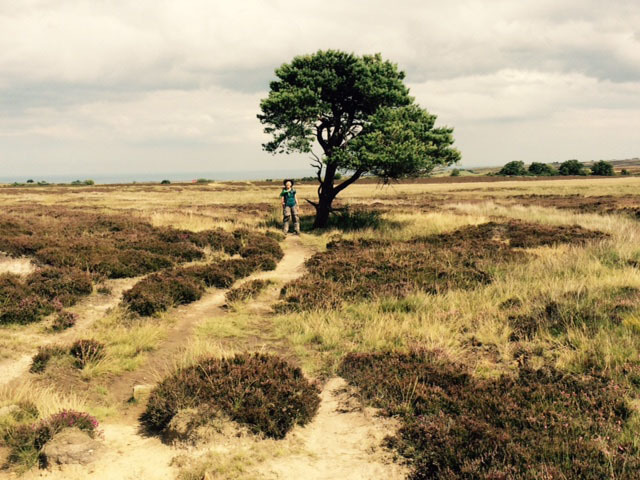 I think the trail ambles up here to look at this not-so-special tree on this moor. It’s best not to look at a map at this point. The trail meanders far south, only to amble off to the far north again, and I’m wondering why we don’t just head straight for the sea. 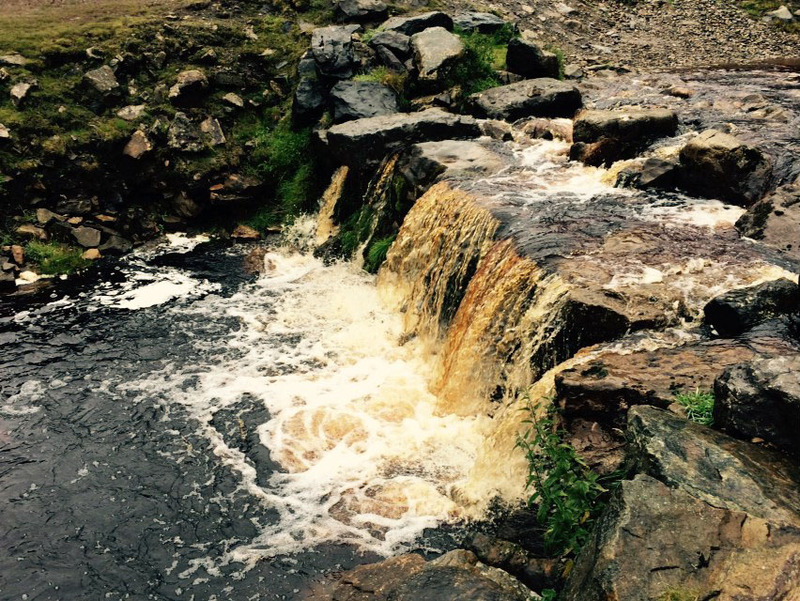 At Falling Foss Waterfall, we step over several dogs in order to sit in the tea tents. At almost every pub, there are dogs. Big and little. They are all welcome. The well-behaved canines thump their tails a couple of times if we talk to them. Mostly they curl up and ignore the world. If people would quit peeking in here, I could get a little napping in. This is his fake “Go-get-’em” face. Dallas Cowboy Fan and I are tired. We’re mustering ourselves for the last push. At the Tea tents several people wish us well and luck to the end of the journey. At this point, I suppose we look like well-worn travelers. As we continue ambling, I’m grumping about the trail’s incessant meandering. 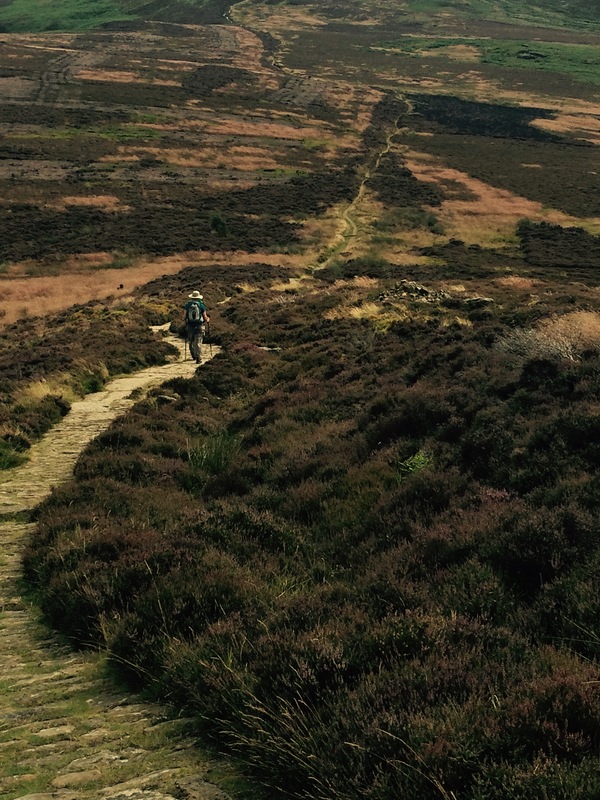 After a bit of road walking, the trail cuts across…MORE MOORS. Hooo Boy! Low, soggy moors. The path fans out in fifteen directions due to hikers trying to find a way across the bogs. There are duckboards floating on top of one of the swamps. There are stones for long-legged jumpers on other bogs. I’m doing my elf-hop across tufts of grass through the worst of it. And KER-SPLASH…I go down. One leg—knee deep in swampy water. I had almost made it through. I have a few choice words for Mr. Wainright. 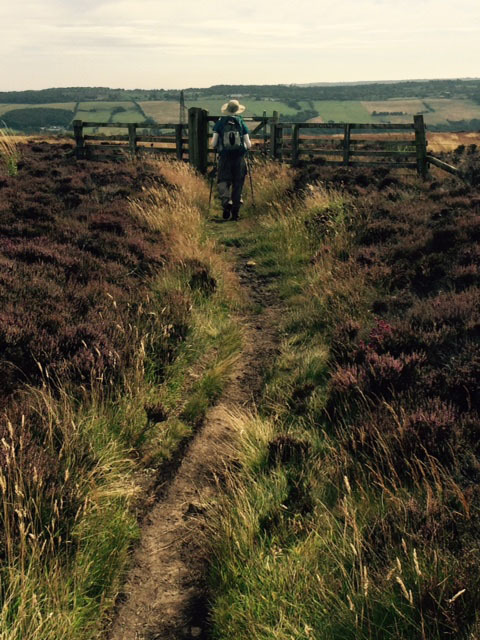 We range through cow paths and finally exit from the moors through a drainage ditch. A honkin’ DRAINAGE DITCH!! slippery and choked with weeds. Now, I’m really cursing the trail’s ignoble passage into the final stage. 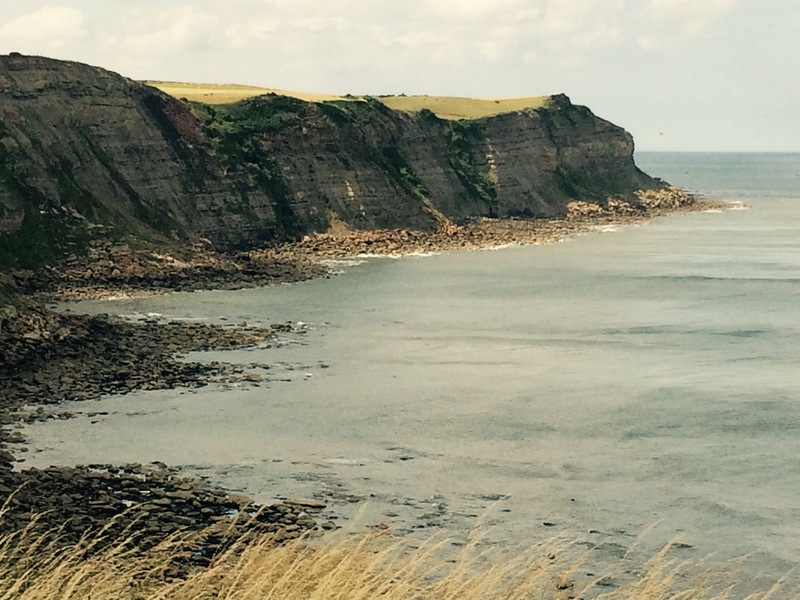 Eventually we come out on a road called “Back Lane” and a sign that says Robin Hood’s Bay is only 2 and a half miles. Whew! Hooray! Following the official C2C along the Back Lane (and through a trailer park) we find signs that indicate we’re now THREE miles away from Robin Hood’s Bay. Whaaaat??!! THE TRAIL IS GETTING LONGER THE MORE WE WALK ????? I’m really using some choice vocabulary now. At this point, I suspect Wainright was simply roaming around because he didn’t want to go home. Finally! The North Sea! Go to the tippy, tippy point of land..and walk in. Finally, we reach the sea. Though beautiful, the cliff walk goes on until my feet are numb. This last day has thrown everything at us, bogs, hills, mud, and steep stone steps up and down, UP and DOWN, the cliffs. WE toss the pebbles we’d picked up on the west coast into the North Sea, and then go to the Bay Bar. Two C2Cers are already there. Four others arrive, and it is a quiet, but satisfying celebration. By tomorrow morning, before the town and the tourists awaken, we’ll be waiting on the sidewalk for Bus 49 to take us to the train at Scarborough and a plane to take us across the ocean to plumbing problems that “are kinda fixed.” (“I snaked the lines and put off-brand Drano down them,” Scout says. “They drain…most of the time.”) We won’t think about what lies ahead. I’m sure that as the sun comes up over Robin Hood Bay, we’ll be thinking about the other hikers across the C2C, lacing on boots and beginning their day. Of the 26 people that we started with, 9 made it to the end. 13 dropped out. 4 persons we lost track of. We hope they make it. And we expect all of our paths to cross again someday because that’s one of the things we’ve learned on the amazing C2C: You never know who you’ll meet around the next bend in the trail. We’ll be taking home more than memories. (I’m taking home the Little Magic Pillow!) We were shown many kindnesses: encouraging words from locals, extra flapjacks or candy bars in our lunch sacks from good-hearted hosts, and I fondly think about the wizened fella who dresses in his tweeds and sits outside his cottage each morning so he can help hikers through a tricky passage, calling out, “Compt this a-way. The trail’s be passin’ behind that barn.” I experienced what hospitality means to a weary traveler. My hope is to carry that graciousness with me into my regular life. But for tonight…we’re headed to the pub. Dallas Cowboy Fan needs to lighten his pockets of those heavy, heavy British coins. If you’d like to read more stories, check out the “Books” or other Blog Posts in the ribbon above. And thank you, thank you for reading! I look outside and see rain with low clouds hanging over Carlton Moors and take another Advil. By now, our 14th English breakfast has lost all novelty. I order porridge with bacon crushed up in it, which seems to amuse the waitress. She’d never had that combo before. There’s actually a lot of wrapped snacks on top of it. Suited up in our rain gear with pack covers, we again begin walking across the moors through the fog and mist. I interrupt our striding to stop at Fat Betty. For some reason this stumpy landmark of a cross exists without explanation. Tradition requires that you take a snack and leave a snack. I leave one of my favorite nut-bars. Dallas Cowboy Fan grouses, “Who wants to take anything that’s been lying out in the rain, for who knows how long?” Finally he has the brilliant idea to leave coins. He feels pretty smug and triumphant about this because at every opportunity on this trip, he tries to pay with the “weird coinage.” He says each time he buys something, he gets heavy money back (instead of paper bills) and it’s dragging one side of his pants down. Off he goes, but I call him back. We HAVE to take something. Tradition demands it! I take a few of the coins he just laid down. I don’t mind having my pants dragged off by money. He frowns at the whole offering, finally tweezing between his fingers a tiny single piece of cello-wrapped hard candy, grumbling like an old badger that it’s probably laced with LSD. After hours of hiking, the topography slowly changes. Trees appear along with old terraced houses built for the early ironstone miners. We know the calendar has flipped from July to August, but we’ve lost track of the days. When we discover that it’s Sunday, we’re concerned—usually every store closes on Sunday in the country. Fortunately, one place has stayed open (Bless you Glaisdale Tea Gardens!). We get cheese and onion toasties and huge slices of coffee cake. Through the windows, the owners point out we’re only 8 miles from our final destination. “Just over a couple of hills.” But it’s going to takes us much much longer to get there. We leave and follow soggyy tracks beside the River Esk. I rip my hat from my head, flogging the hundreds of black flies buzzing us. And in doing so, I pop the BB-size stud out of my ear. It’s a memento of another hiking trip, and Dallas Cowboy Fan thinks he can find it since he’s pretty good at finding golf balls in the rough. I think he’s nuts, and besides, I’ve been wanting to get some new “English” earrings. But……… I’ll be jiggered! Due to his persistence, we find that ear stud even though it’s jade green. Buoyed with our success, the sun decides to break between the clouds. We pass through the quaintest town of the whole C2C: Egton Bridge. Grand stone houses surround an uninhabited island on the river. An old toll road leads us on to Grosmont. The toll fares are still displayed in shillings. As we near town, the screech of a train whistle makes us look at each other. In a few minutes the chuff-chuff-chuff of the engine travels across the countryside. We pick up the pace. This we gotta see!! The one-street former iron-smelting town is dominated by the station and intermittent comings and goings of steam trains. We can get up close and personal with the big ol’ magnificent monsters hissing white vapors and belching smoke. These locomotives were part of the Hogwarts Express and were featured in the first Harry Potter movie. We’re also able to amble through a loooooong tunnel and visit the old loco sheds. Queen Victoria made jet popular, wearing it as “mourning jewelry” for her beloved Albert. explain the uniqueness of a local stone called Whitby Jet, (wood from the Monkey Puzzle tree which has been compressed in the cliffs for a million years …really…I’m not making this stuff up.) Well, say no more… I can get jewelry crafted by a local gal, from local jet stone, with a portion of the sale helping the local locomotive museum. 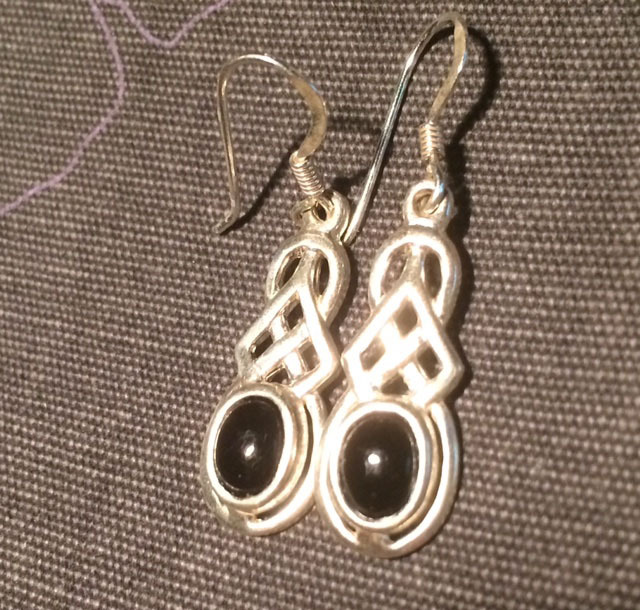 Even though I found my lost earring, how can I resist the opportunity to wear British Monkey Tree fossils? Our B&B is part of the Geall Art Gallery, beautifully adorned and right beside the depot. Once again, we wish we had more time to hang around. What’s not to love about a town that has a bookshop with overloaded shelves and a village store with jars and jars of multi-colored pence candy? I buy 50p of pear drops. The clerk tucks it in a bitty paper packet just like they do for BBC’s Father Brown. I sit at the station, drinking Elderflower juice (yep, that’s what the bottle says) and waiting for Harry Potter to arrive. “Pear drop?” I offer Dallas Cowboy Fan as he strolls past like a local. It looks like he’s headed toward the Tavern. I’m guessing he plans to unload more heavy coins. 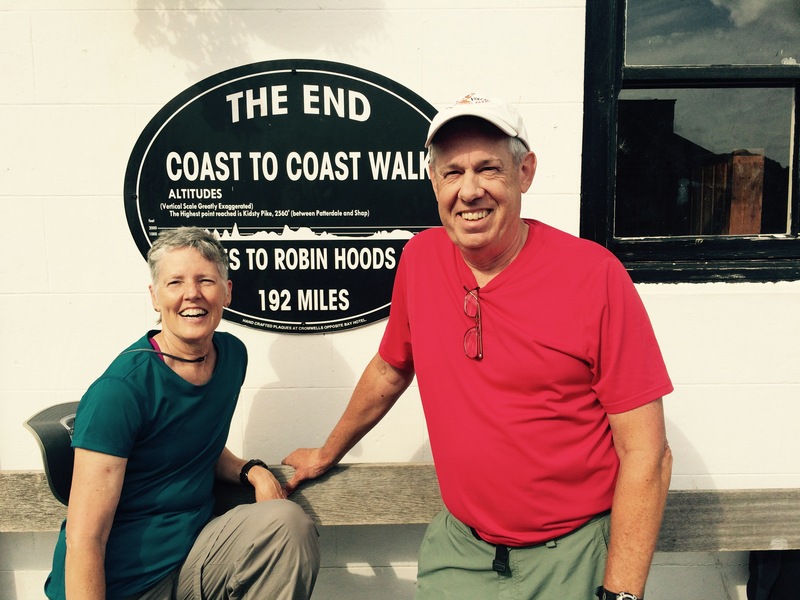 NEXT: Day 15: The Final Frontier: One More Doozy Bog to Cross: Walking Across England: Coast to Coast. Of course, the path starts out lovely and elf-like through the woods. Immediately we begin climbing through country estates of moor after moor–each one getting higher, and my eyes getting bigger and bigger at the “rollercoaster gradient” (as the guidebook charmingly calls it). I had expected a rather “flat” day of walking. By the time we’ve gone a few miles, we’ve reached nearly 3800 feet of accumulated ascent. Earlier, we’d stopped at Lord & Stones Tea Room for a second breakfast. Now we stop at ClayBank Top ( a wide spot in the trail) to eat our packed lunches. It’s one of the few places we can get a phone signal, and if we had any sense, we would call a B&B to come get us. (HINT: Stopping over at Claybank is the No. 1, item on our “If-I-had-To Do-It-Over List.” There’s only one inn within the moors (and we aren’t even close to it yet), but B&Bs from the surrounding towns will pick you up and drop you back off the next day.) Do it…or you’ll find yourself doing strange things. . . out of tiredness. I know I said I would stop taking shortcuts, but I lied. 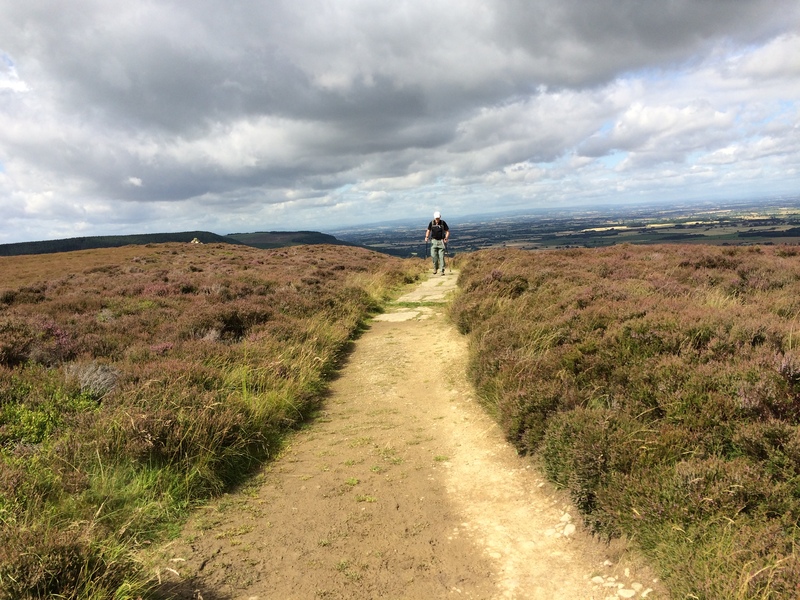 The first chance I had, I asked locals for secret byways across the moors. I was told, “There aren’t any.” Curses. The trail stretches out as far as we can see in front and behind us. There’s no one around. Mile after mile. And another mile. Then another. A little hike-crazy, I sing show tunes to pass the time. Dallas Cowboy Fan walks faster in an attempt to get away from my Broadway Revue. 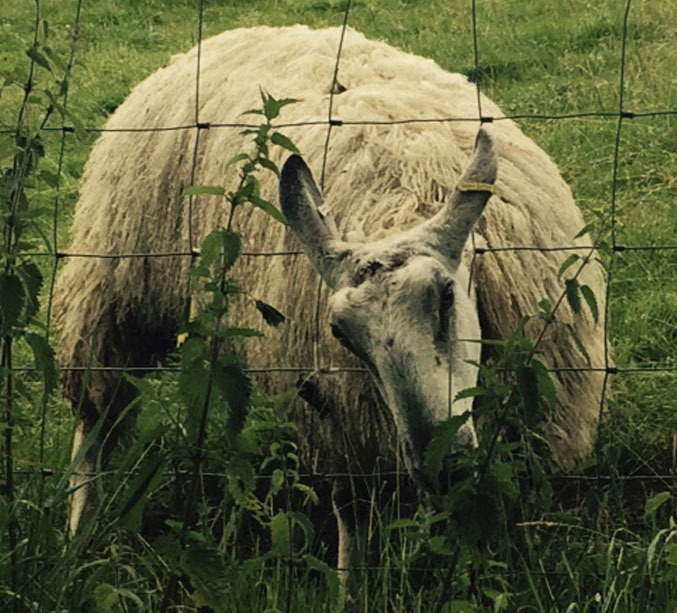 But he has begun to talk to sheep….and keep up their end of the conversation. Sometimes he’s interrupted by grouse, harking, “Ralph, ralph, ralph,” as they fly away. And I ralph right back at them. 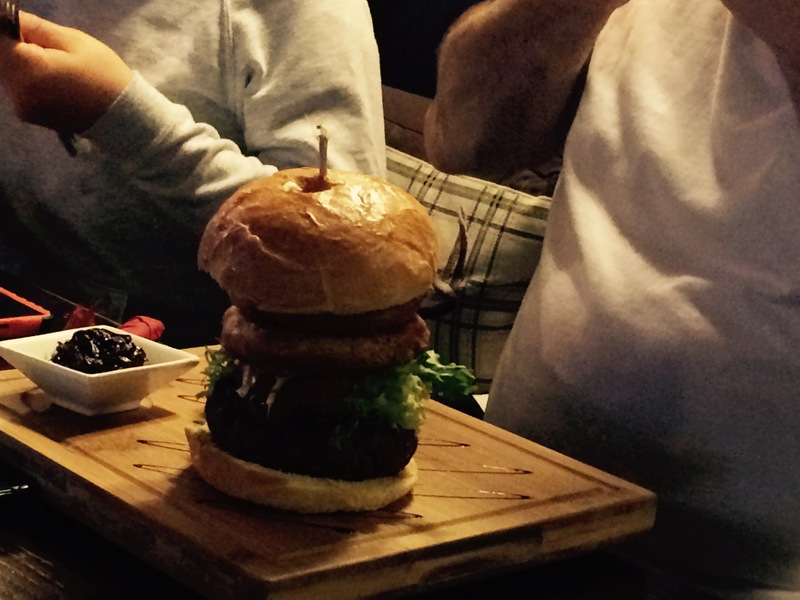 Throughout England, I NEVER received a burger less than 6 inches tall. Then we talk to each other. Bad jokes. tired-stupid laughter. Stories we’ve heard before. Stories we don’t want to leave in the moors. We hone the “Where-Can-We-Hike-Next List.” Of course, food is a topic. But we’ve discovered from previous long hikes, there comes a stage when appetite disappears and eating is simply a function of intaking fuel. This is the second time on this trip, we’re really not hungry, and not even discussions about the piles of potatoes, yardages of sausages, or uber-stacked hamburgers we’ve been served in England sound good. Eventually we settle into the quiet zen of walking, our legs roboting along in automatic strides, our poles thumping the beat. A light mist begins to fall. And the miles roll on. After a long while, we round a bend between hillocks and I shout. Through the distant haze, I see the red roof of the ONLY inn on the wide, wide moors. By the time we reach it, the bottoms of our feet are numb and both of our water bags are empty. I chug a pint as soon as we reach The Lion. We’ve jumped ahead of most of the other C2Cers. Only 6 other people made the long haul today. After dinner, we slip into our Swing-A-Cat room (my term for “It’s so small, you can’t swing a cat without hitting the walls). It doesn’t matter. By now we’re used to rearranging rooms, sticking tea trays in drawers and chairs in amoires. It has a tub to soak in. The heat and the drying racks are on. Rain is tapping against the window—and after 21 miles, we’ve finally made it inside. Okay. I’ve become a rebel. A malcontent. I LIKE using the public right-of-ways across private land and shouting (with fist raised), “Power to the People! !” I have now learned that wherever we go, there’s a back way the locals use to get there. And they do! Take the road. Goes directly there. No circling around. Yes, walking on pavement is really hard on the feet and back, but this shortcut has wide, grassy right of ways to hike on. It’ll cut 3-4 miles out of the day. Dallas Cowboy Fan isn’t so thrilled, but he lost his vote on the 3rd day when he elected that we traverse the “HIgh Road,” the ever-lasting ridgeline climb along Helm’s Crag. So, looking forward to a day without sheep or mudslick trails, we take off. My feet are pacing to the beat as I hum the Wizard of Oz’s “Follow the yellow brick road.” We make wonderful time along the sidewalk that partners with the road. Before us are knee-high weeds and thistles. Walking on the asphalt is out of the question. Traffic is buzzing past like it’s a Mad Max movie. If I didn’t have a hat with one of those neck strings, it would blow off with each passing lorry. Dallas Cowboy Fan stomps through the nettled puckerbrush, his hand clamped to his head to keep his Dallas Cowboy ball cap on. At one point, we climb under trees and crawl under a fence so we can walk at the edge of a wheat field, away from traffic . I get a handful of stickers for the effort—AND the wheat field soon ends. Dallas Cowboy Fan is walking in front of me, parting the grasses and stepping over road debris. I’m pretty sure I can see steam coming out of his ears. After two and a half hours of tramping through knee-high weeds, we come to the A19. Now, if we had taken the original Wainright trail, north of here, we would’ve had to run across this motorway, dodging 6 lanes of traffic. But this shortcut leads us through a nifty underpass, onto a lonely road. Road noise falls away, and we’re suddenly standing next to a sign, announcing we’ve reached the moors. This man does not look happy, even though he’s reached the moors. Within 30 minutes we’re sitting at the oak tables in the delightful Golden Lion in Osmotherly, having a pint. And who should we find there? KIM. Kim, the 24-year-old Berliner, who we’d first met 12 days and 143 miles ago, who’d banged up her knee a few days ago, whose journey should’ve ended. And yet, she’s still moving forward. And that’s one of the joys of the C2C. No matter the trail. The difficulties. The Not-So-Smart shortcuts. There’s an inexplicable delight in the surprise meeting of our other sojourners. Osmotherly is an enchanted village for a hiker. The wide windows of our room in the Golden Lion look down on the town center where John Wesley preached at that market table (next to the tractor going down the street). Tidy, terraced cottages whisper of the flax workers who used to labor at the mill. There’s even the Boot & Coffee Shop (in addition to 3 pubs). And to add comfort and homey-ness , each table at the Golden Lion is graced with a lit taper (even at breakfast). Ding dong ding. Every 15 minutes all through the night. Just then the church bells begin their slow toll in minor keys, and THAT should’ve foretold me: I’D AGREED TOO SOON. Blame it on the nice bed and hot tub. Blame it on my Little Special Pillow which helps ease my back. But Dallas Cowboy Fan and I look at each other this morning and say. “I don’t really feel like walking today.” And then I tie the Little Pillow onto my suitcase like it’s a fat, reluctant hostage. Dallas Cowboy Fan puts on his boots, and we head for the trail, lest we think too long about going back to bed. We do a bit of shopping around town. Richmond, unlike other villages we’ve passed through is open for business EARLY. Picking up some meat pies for lunch from Taylors Noted Pie Shop, we then buoy ourselves at Frenchgate Fudge & Chocolate Makers by loading up on thick hot chocolates and a good supply of chocolate-rum truffles to get us through the day. Yep, his head is stuck in the fence and he could’t figure out how to back out. No. He isn’t still stuck there. slant. Hoo Boy. Happy July 30th. We don’t faff around. We are getting very good at whipping out our rain gear and suiting up. Even the sheep are clustered under the trees today—which, Dallas Cowboy Fan says, “Is the smartest thing I’ve seen any sheep do, so far.” He doesn’t consider them too bright. We round a corner and are surprised to find Leslie, a British C2Cer. She is standing still and straight like a little gnome under an oak tree because she has no rain jacket or brolly (umbrella–which some Euros hike with)She plans to wait a wee bit for the storm to pass. We continue through barley and rapeseed fields. 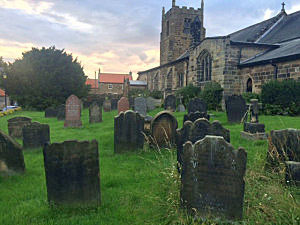 After 7 miles, we stop in Bolton-On-Swale at the lovely St. Mary’s church. We’d hoped it would be open and it is, offering refreshments. We sit in the breaking sunshine among gravestones, sipping hot tea and trying to dry out. A gentle lady comes through the cemetery. She and another parishioner consider it their service to take turns, coming to the church each afternoon to make sure there are snacks and libations. 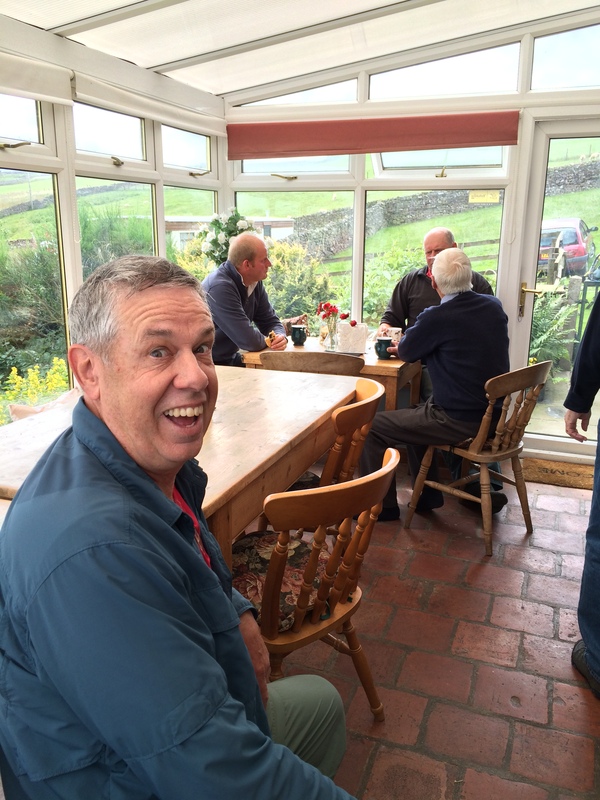 5 weary hikers (including Leslie and us) pass through to sip hot drinks and chat, soaking up the kindness. Again and again, I’m touched by the hospitality shown to strangers. We leave a donation and put a pin in the world map to mark our home. We are the first to mark Oregon. In a few more miles, it doesn’t seem like we’re in the United Kingdom anymore, I learn once again, I must correct my images of what England looks like. We are passing through broad fields of wheat—like in Oklahoma or eastern Oregon. Moses, in the middle of a golden sea. Dorothy, is it possible we’re not in Yorkshire anymore? It seems that across the whole of England, only several farmers don’t like hikers crossing their land. The guidebook tells hikers to TURN Right at the Blue Garage Doors in Streetlam. I’m telling you to turn left and take the road the rest of the way to Danby Wisk. You and your boots will miss a slip’n’slide experience through a horselot several inches deep in gooey muck, a boggy creek bottom with weeds up to your crotch, and carefully treading next to a wheat field in which a farmer has erected an electrified line a couple of feet high and just a few inches beside the trail to keep footfalls on the outer 6 inches of the field. I’m sure it’s tiring to have people passing through your land, and I’m not sure why the “official route,” does so, but I suggest taking to the road, and thoroughly enjoying the folks who love having you near their village. And Danby Wisk is a great area. Jean at the Ashford House gives us a cuppa when we arrive and encourages lively discussions around her kitchen table. She even joins us at the White Swan for a pint. We’ve discovered the best places that we’ve stayed are because the owners sit down and visit with us…as though we were family. (An amazing gift of time in their busy schedules). We are now in a routine. Each evening we walk into a village, thirsty for a pint of something. We eat, do our chores: filling water bags, replenishing our packs with snacks, looking over the next day’s route, and rinsing FAST-DRY underwear. We text for updates on the plumbing and get nebulous replies like: “Still working on it.” I slather my feet with Vaseline and snug them into socks, then make notes in my journal, falling asleep with pen in hand. Dallas Cowboy Fan tries to find sports on TV, falling asleep with the remote control in hand. The next day we walk and do it again. But this morning….while we are waiting for our porridge, beans, and smoked bacon, a young lady slips into the chair next to mine. KIM!! Kim of Berlin, dredlocks, and swollen knee fame. She’d stumped in late in the evening. Through the rain. Wet as a fish. And here she was ready to go again. Tyler Burgess in one of her walking tip guides has said that during the C2C, almost everyone has some part of their body hurting. I think of that often whenever my back aches. But here is a gal doing a stiff-legged stump along the trail. I’m inspired. c) The roiling water is carrying sediment because the stream has risen 2 meters since the day before due to all the rain. We have begun stopping at village benches, having a snack, and watching the world go by. Actually, while here in Healaugh, nothing goes by. Not a car, bicycle, or human, and we wonder if the world has ended and we’re so far in the dales, we don’t know anything has happened. 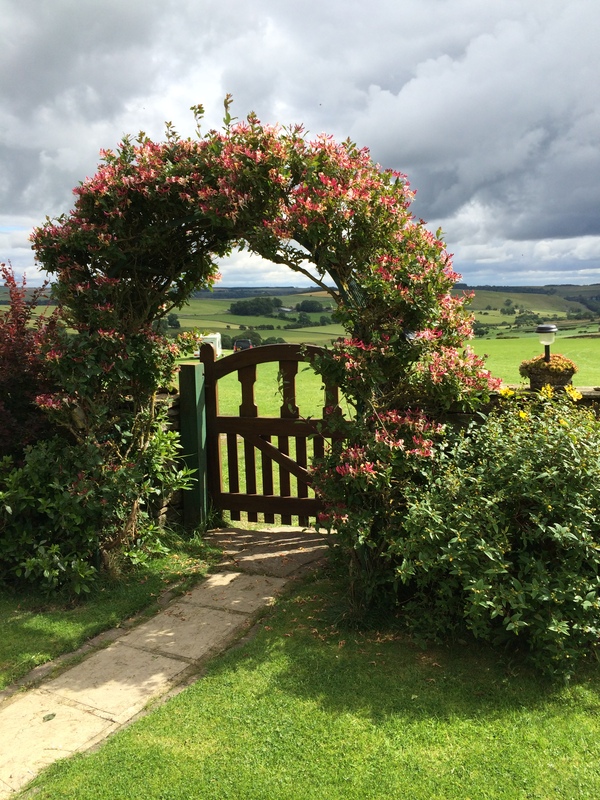 We stay at the Buck Hotel in Reeth. It has a grand pub, and I’m surprised to be served one of the best pizzas I’ve ever had. 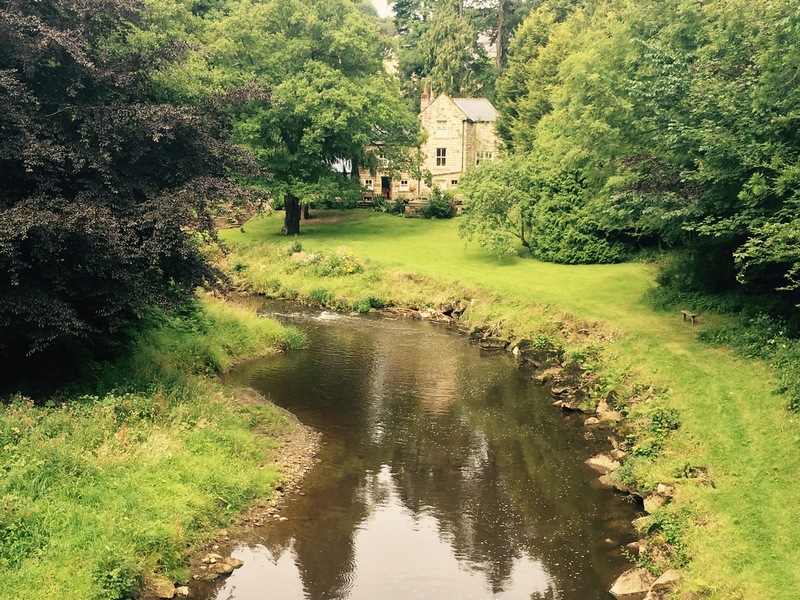 Day 10: Reeth to Richmond: 11 Miles. Whoo-Hoo. This day starts out sunny. We blink like bats at the light. Within a few miles of starting out, many of the C2Cers have clotted together. Fourteen of us traipsing across a pasture. This is the first time we’ve ran into more than 2 other people (except in pubs). We thread our way through a corral of cows lying around, and I take off on another shortcut. I laugh at how nervous and insistent I used to be about staying exactly on the path. Well…actually my wanderlust turns out not to be a smart shortcut. We’re soon tracking in cattle muck 4 inches deep, but armed with compasses and a GPS we make it to a local bridleway by cutting across fields. I’d bent off-trail because I’d read about a tea room in the middle of these pasture lands. A refuge among the sheep, and I’m looking for it. And sure enough, we find Elaine’s kitchen. Her glass conservatory has a group of neighbors packed into one table. Dallas Cowboy Fan and I step into her kitchen. Thousands of ribbons for sheep awards hang from the rafters. A frypan of something on the stovetop smells delectable. We ask for hot chocolates, toasties, and homemade apple pie. Soon 3 other C2Cers find their way to her little tearoom. I look around, amazed that I am in the middle of England, eating at a sheep farm, like it’s a family reunion with old friends. Moving on another 3-4 miles, we stop at Marske, an estate town with proper, tidy lawns. Taking our well-suited place on the town bench, we have lunch and I discover that I LOVE the pack lunch of tuna and sweetcorn on malted brown bread that last night’s B&B has made for me. In 6 more country miles, we arrive at Richmond, the biggest city on the trail. We do a quick tour of the castle ruins, but hurry back to Arandale Inn. Our eyes pop out of our head when we see our room. A claw-footed tub. A separate shower, in a bathroom as big as our bedroom. We’re soon floating around a hot tub (and I soaked in the claw-footed tub, too) before we head out to a French restaurant. And Scout’s Text didn’t even phase us: Still working on plumbing problem. Now a gutter is plugged, water running off roof and down side of house. 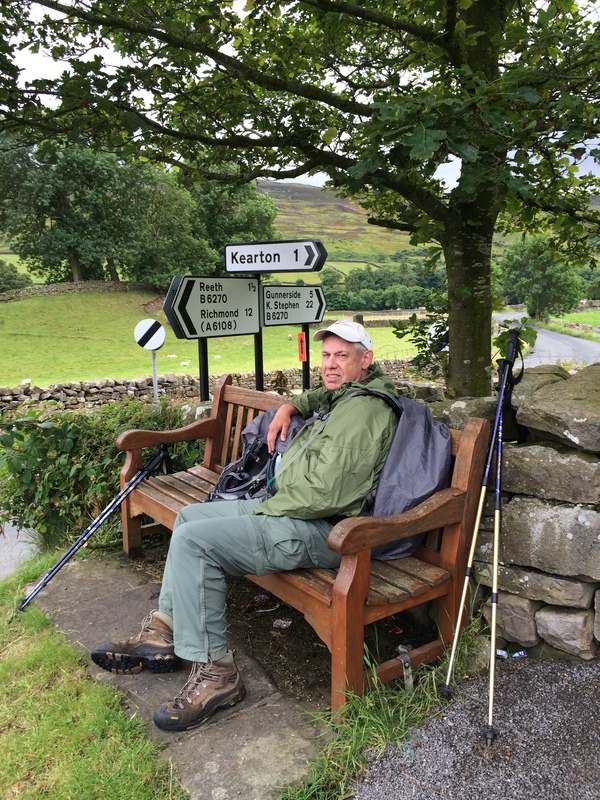 NEXT: I Don’t Think We’re In England Anymore: Day 11: Walking Across England: Coast to Coast.